The Novotel Phuket Resort stands out as having the Best Sea View on Patong Beach and his first class accommodation and service are a natural extension of our daily mission to provide you with the ultimate resort experience. 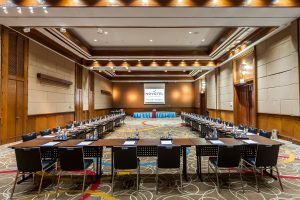 Standing at a Premier location in Patong, this International chain managed resort enjoys magnificent views across the Andaman Sea and Patong Beach. Above all from every food and beverage outlet, swimming pools, lobby and almost everywhere in the resort. The Resort neighborhood lush landscape and exotic gardens with a serene and quiet environment is unequaled. Perfectly set into the green hills above Kalim Bay, Patong beach. Novotel Phuket is the resort of choice for modern leisure travelers. Novotel Phuket Resort houses 217 rooms, each with private balcony and stunning views of the Andaman Sea and Patong. Therefore a must for the sunset lovers and for a peaceful retreat.